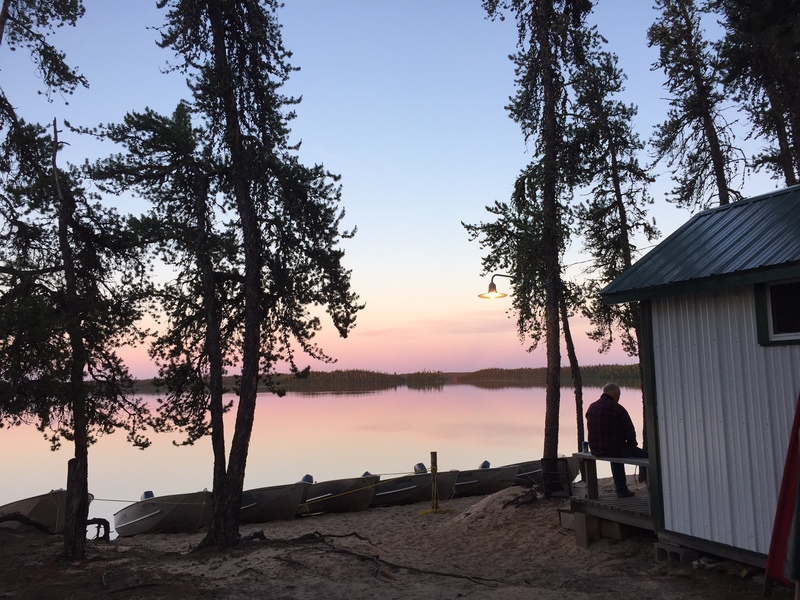 Mawdsley Lake Fishing Lodge lies north of the Churchill River, near the Key Lake road (provincial road #914) in north central Saskatchewan (56°47’45″N 106°07’20″W). The nearest point of civilization is a First Nations community settlement, Pinehouse, 160 km (100 miles) south. Saskatchewan, Canada, is located directly north of Montana and North Dakota, USA. Mawdsley Lake is about 960 km (600 miles) north of the USA border. * Tadei Lake is locally referred to as East Mawdsley Lake. Access is via the Key Lake road through Meadow Lake, SK (Hwy 55, 155, 165) or Prince Albert, SK (Hwy 2, 165). Drive north on #914, a gravel road to Pinehouse Lake. A gas station is located at the town site. Continue on #914 to the Haultain River Bridge, 159 km north of Pinehouse Lake where guests are picked up by boat to complete their trip to the Lodge. The closest major airports are Saskatoon, SK (388 miles/646 km) or Edmonton, AB (500 miles/840 km). Float plane flights directly to the Lodge from La Ronge or Buffalo Narrows, SK can be arranged by our guests themselves. When guests book such flights with servicing airlines, they must be aware that significant extra charges will apply. We greet our guests at the Haultain River bridge. Parking and our dock is to the right after crossing the bridge between km 159 and 160. 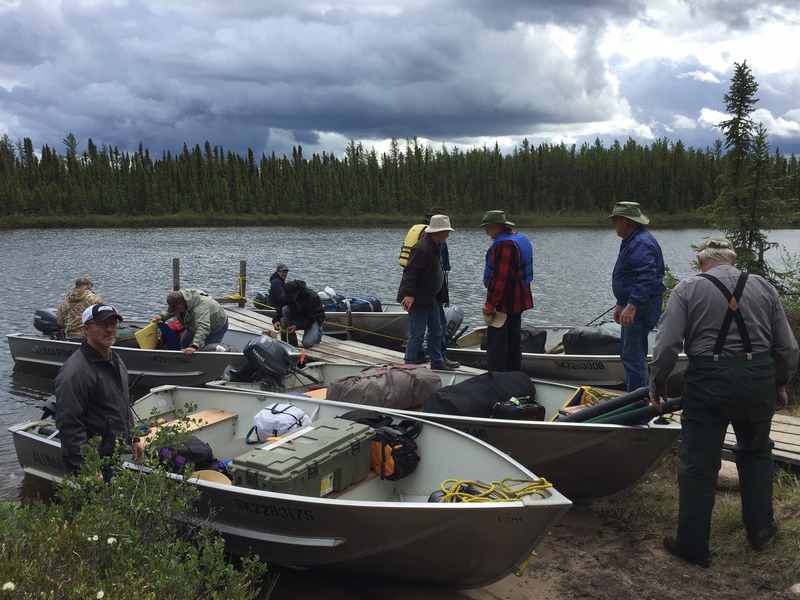 Guests travel to the Lodge via boat, a 15 minute trip. Guests should plan to arrive at the Haultain River bridge between 12:00 and 1:00 pm on the start date. Departure is between 6 and 8 a.m. on the leave date, as you prefer. Contact Tourism Saskatchewan (www.tourismsaskatchewan.com) for free road maps and additional information. Contact Budget Rent-A-Car in Saskatoon, SK at toll-free 1-800-844-7888, or email Budget for a discount rate. Ask for the “SKOUTFIT” rate code. Note: Immigration Canada may not allow persons that have an outstanding USA offence such as a DWI, or some mark on their record to cross the border into Canada. Please check before leaving.